Incensed at the brazen and unprecedented kidnapping of more than 200 schoolgirls, protesters are calling for a "million-woman march" in the Nigerian capital on Wednesday over the government's failure to rescue scores of schoolgirls kidnapped by Boko Haram Islamists two weeks ago. 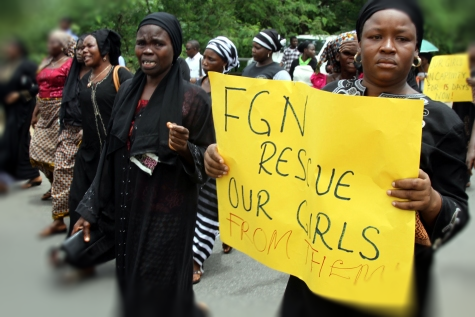 "May God curse every one of those who has failed to free our girls," said Enoch Mark, whose daughter and two nieces were among the more than 200 students abducted from the Government Girls Secondary School in the Chibok area of the north-eastern state of Borno. The protesters were demanding justice for the actions of the radical Islamist group Boko Haram, whose members kidnapped as many as 234 schoolgirls on April 15. A groundswell of anger has swept through the public, incensed by how poorly the Nigerian Government has been handling what is increasingly viewed as a rising insurgency. The events earlier this Month were truly horrifying and despicable; Nigerian teachers begged the group to "have mercy" on the girls who were dragged from their school for going to classes. Since then various reports have arisen that the girls are being forced into mass marriages and shared out as wives among the Boko Haram militants. Some locals have even been quoted that they have also been carried off to Chad and Cameroon, with each girl being sold as a bride to Islamist militants for 2,000 naira — $12. At the time of the attack, the Nigerian military, local officials and girls who escaped the April 15 kidnapping at the Government Girls Secondary School in Chibok blamed the attack on the Muslim terror group Boko Haram, whose name means "Western education is sinful." Boko Haram was responsible for 3,982 deaths so far this year, according to the Nigeria Security Tracker website that John Campbell, former U.S. ambassador to Nigeria, maintains at the Council on Foreign Relations. The government campaign to eradicate the terrorists, however, has caused almost as many deaths in the same time period, according to the database. But the massive kidnapping by militants who want to create an Islamic state in the Country with Africa's largest economy that is half Christian and half Muslim is unprecedented.